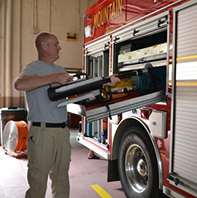 GawkStopper® is an Emergency Responder’s best friend when the call requires a privacy barrier. The more challenging the conditions, the more you’ll be glad you chose GawkStopper®! Stand filled with sand (for extra ballast) weighs 42 lbs. 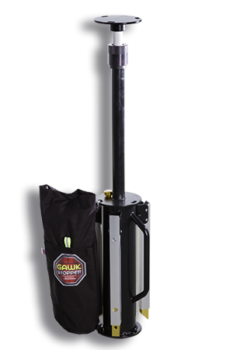 One of GawkStopper’s® best features is that it deploys in under 60 seconds. That’s an amazing claim to make, so we’ve included a time stamped video so you can see for yourself. Seconds can be critical, so besides being the best built portable privacy barrier system available, it’s also the quickest and easiest to deploy. Watch and see! 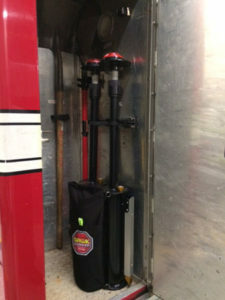 Whether it’s in the trunk of a police cruiser or in the storage compartment of a fire engine, GawkStopper’s® small footprint makes equipping your vehicles easy. Everything you see in the photo of the folded up stand is the complete unit, plus one additional stand. All the accessories are in the heavy duty pouch. The concealment tarp is made from an especially durable UV stable material for extra long life. The stand is made of powder coated high grade steel and the retractable legs are made from sturdy aluminum. The retracted height of the stand is 42 inches. Contents: Carabiners & Bungees for attaching Tarp to stand • 6 large spikes for anchoring legs on soft ground • 6 smaller spikes for anchoring legs on ashpalt surfaces. 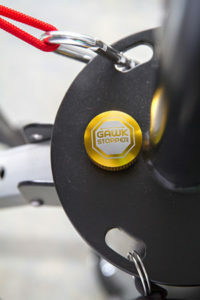 Setting up GawkStopper® is about as easy as it gets. 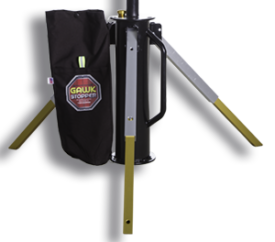 The tarp and every part needed to completely assemble GawkStopper® are included in the nylon pouch that comes attached to the stand. The spikes can be used for added stability using the holes in each leg (above). You can get even more stability by adding sand to the stand through the easy filler cap pictured below. When full, you gain 12 lbs. of ballast. After seeing all of the facts and comparing GawkStopper® to all of the competitors, it’s really not fair because GawkStopper® easily out-distances them all. In tough weather conditions, GawkStopper® out performs everyone. No adding sandbags to provide ballast for cheaply made stands, everything is self contained and deployable in under 1 minute! Handling difficult terrain is our specialty and when it comes to durability and toughness, no other privacy barrier comes close. Why would you choose anything else? 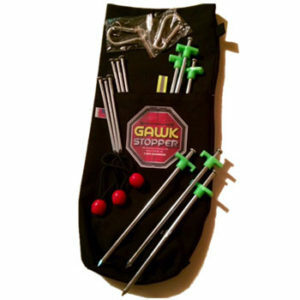 Get GawkStopper®, the only choice!